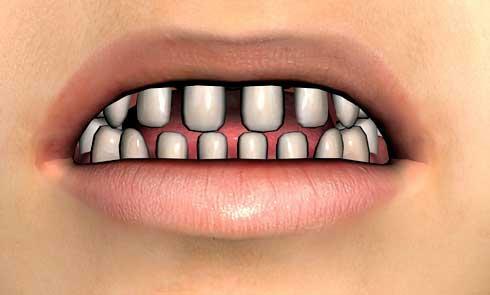 Please help us resolve the problem with the teens, so we can start rendering cute young people who can show their teeth! Nice PM..Now we just have to wait for a response.. I just went back to look at product promo images. Neither Justin or Julie have any images with teeth showing in the promo images. However the Faces for Teens promo images show lots of teeth, and they look fine. I don't have that product. I wonder if it has a teeth morph fix built into the poses, or is something just went badly wrong with the Justin and Julie models after the promo images were created. Or, I wonder if there is interference from some other package we have installed that affects the teeth in a way the vendor did not anticipate. Can anyone test the faces of teens to see it those expressions fix the teeth? The in-program icons for Faces of Teens look like they also have the problem. The expressions themselves definitely do. Thanks for testing. This seems to be more evidence that something went wrong with the models after promo creation. Perhaps something like what RAMWolf suggested. I am encouraged now that this may not be what the artist intended, and it may get fixed. Hey guys - Thorne is away for the Christmas holidays until after New Year, since its in the middle of nowhere she doesn't have any internet access until she gets back home. Well in that case, I think I will file a bug report on it. Feel free to add your comments to it. They didn't even fix the UV on the basicsuit yet after a huge response from the public:) But maybe they have some christmas spirit. So can we confirm that the teeth is indeed a glitch? ...so much for doing a giggly Leela. From what I have seen in the past, Thorne pays a great deal of attention to small details and something like this would never have passed by into the final product release. True, Daz had the characters "on ice" for several months after buying them and it is unknown what took place in that time. Whether any additional "editing" was done is unknown but wouldn't be beyond possibility since Daz, effectively owned the meshes. Why they would mess up the teeth though doesn't make sense. You would expect that kind of a modification of the teeth in a dedicated Kid 5 package. I don't recall hearing any kind of a hint about that. Is it possible that someone was intending that these figures be mixed with basic child to get younger kids who might still have baby teeth? But even then the kids wouldn't have *all* baby teeth. From about 5 or 6 there'd be a mix of baby and adult teeth. By 11 or 12 it's just molars which still need to get changed over. Some reason it wont accept my log in :(Mine neither. How bizarre. The products is supposed to be dedicated to delivering "Teenagers" not toddlers. It is not an appropriate morph that should be hard wired into the teens FBM. If it was intended to be part of it, it should be a single 'additional' morph that should people want toddler teeth they could dial it up separately. But really, for a teenager pack, it never needed to have toddler teeth anyway. It's not even relevant to it's product, which seems much more like a glitch/bug. Oh good, it's not just me then lol. I thought it was strange since the forum and store still allow my log in. It's a different system, you have to create a new log-in for the bug report. You can use the same login info...it just needs to be set up again. I've dealt with many places that use that system and yeah, all of them require a separate login to Mantis...it is a security feature, that actually does work. It keeps the bugtracker separate from everything else. I have nothing by the name "Dental Plan". Please help: what is this Dental Plan and how do I get this into DS? (I am using DS 4.5 64bit on a mac. This was Draagonstorms solution using Dental Plan.. There are many ways to fix the problem. She went with the teeth size all dialed in negative. Dental plan isn't availble yet. 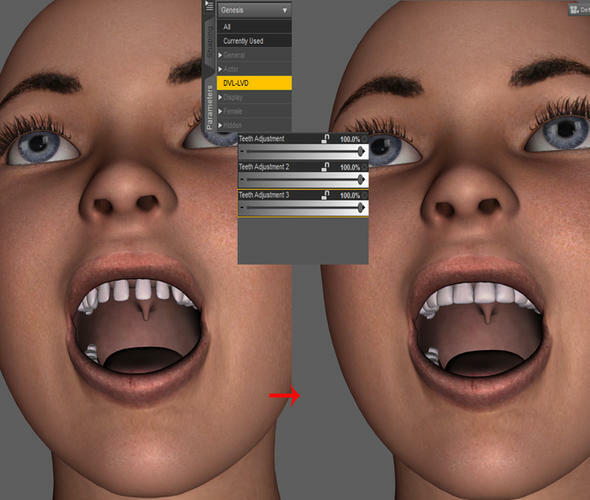 If you have either Hitomi or Hiro 5 theres a smoothing teeth morph that helps. And it most definitely was/is caused by using the smoothing brush too close to the mouth, with the teeth unmasked. I tried a couple of experiments, using Blender and it's sculpting tools (don't have Zbrush) and it didn't take much to get them to look that way. Just a couple of 'light taps' on the lips (mainly where they meet). The first tap opens the lips just a fraction, almost not enough to see...the second hits the teeth directly. Never mind...see Ebahr's post a couple down. Just to increase the thread count number, so maybe this will get fixed, I will add my comment. I agree that the baby teeth look awful on the young teenagers and I don't think we should have to buy another product to fix it. I assume Daz will have a free fix? You beat me to it...if I wasn't having problems with my CMS database, I would have had it out last night...it really is a PITA that saving content for distribution is so difficult with a non-working CMS. (fortunately I don't bother with Smart Content or categories...so wiping and going back to the default db wasn't painful). Oh well, sometimes you're the windshield; sometimes you're the bug.